As scientists explored this mutation, they found that ob/ob mice lacked a leptin receptor. The iceberg that changes the leptin signal into action was gone, and even though the stomach wall produced plenty of leptin hormone — “Stop eating! Stop eating! You’re full!” — that signal never reached its target. The radio station was strong, but none of the resident mouse cells had a radio tuned to pick up the signal. As a result, the mouse kept eating and eating. In short, a gene mutation, inherited from their parents, saddled them with the sin of gluttony. These three are the signals sent by the stomach to tell the medulla how that Oreo is progressing: ghrelin to stimulate eating, and leptin to stop eating, along with stomach stretch signaled directly from the stomach muscles to let the brain know how full the stomach is. 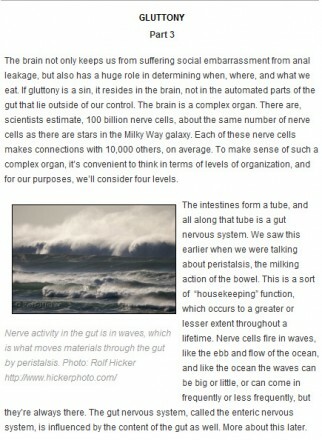 Further down the gut tube, the small intestine has its own suite of hormone signals. In the duodenum, the fat in the Oreo filling spikes a hormone called cholecystikinin, “CCK” to his friends. “Chole-” means “bile”, the same word root as “cholera”, thought by the ancient Greeks to be caused by an excess of bile. Remember that bile is used to emulsify fats — break them into tiny bubbles that can be absorbed by the gut and passed into the bloodstream. The wheat protein in the cookie wafer of the Oreo also stimulates CCK. The middle syllables, “-cysti-,” refer to a fluid-filled sac, a bladder, in this case the gall bladder. The suffix “-kinin” signifies movement, in this case, the movement of bile from the gall bladder into the duodenum. CCK also signals the medulla of the brain, letting the brain know that the Oreo is larded with lipid. The sugar part of the Oreo, converted mostly to the simple six-carbon sugar glucose, is absorbed in the remaining twenty feet of small intestine. There, it triggers release of a hormone which also acts as a neurotransmitter, the semi-famous serotonin. Serotonin is an amino acid, one of the pearls which strung together make up peptides (if there are several or dozens of pearls in the string) and proteins (if there are hundreds of amino acid pearls). Many people know serotonin from its role in regulating mood. For example, the antidepressant Prozac works as a “selective serotonin reuptake inhibitor” (SSRI), blocking the molecular sponges that sop up serotonin where nerve cells come together. The excess serotonin left behind in the synapse elevates and smooths mood. Many people feel that serotonin from food has an effect on mood as well. 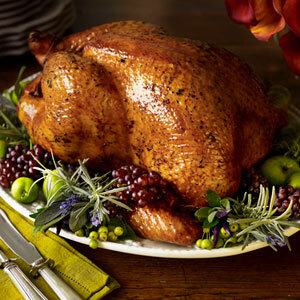 Some foods, like your Thanksgiving turkey, have serotonin as a minor component. Other foods, like the Oreo, have a high sugar content that triggers the release of serotonin from the intestines. Another intestinal hormone signal is peptide YY, which like leptin from the stomach, acts to reduce gluttony. Both the tenth cranial nerve (vagus) leading back to the medulla and a crescent-shaped sliver of tissue in the hypothalamus, the arcuate nucleus, seem to have PYY receptors. Glucagon-like peptide-1 (GLP-1) is a final intestinal hormone that acts on taste centers in the medulla and also a part of the brainstem called the area postrema. Stimulating the area postrema leads to vomiting, but the GLP hormone seems to have a less dramatic effect. GLP is a cousin to an enzyme called glucagon which is released from cells in the pancreas. The most famous of the pancreatic hormones, insulin, causes glucose to be mobilized from the bloodstream into hungry cells in all organs of the body. On the other hand, glucagon moves glucose into the starch-like molecular complex called glycogen so that, in times of need, the body can tap its energy reserve — about 2000 calories — held in glycogen storage in the liver and muscles. For example, marathon runners famously “hit the wall” after about 20 miles, a distance that takes 2000 calories of energy to cover. At that point, the glycogen “tank” is empty and other reserves, more difficult to convert to energy, must be tapped.